Honestly, I’m still learning this. I’m still working on allowing my Powerful Self to be here. Sometimes I feel weak and worthless. I feel so courageous that I blaze through whatever stands before me. I feel an internal Lion Courage. The one who stands tall, with feet firmly planted below. ☝🏽 She’s the one I’m bringing more often into this life. And yea, I fully embrace the other times too. They all belong to me. Accepting our Shadow and Light. As much, and however many times we fall into the Shadows - remember that our Powerful Self is Always and Will Always Be There. This week I really, truly, deeply believed I was going through menopause. I started panicking. My flow was atleast 1 week late, with no explainable reason. My back was on ‘fire’, with no release. My emotions were intense. Night sweats were on full blast. The feelings were similar to when I was pregnant for the very first time. And though, I know I am finished with bringing children physically into this world, something about this possible transition triggered me. I had my 38th Birthday on Saturday, and through all the emotions, I checked for more gray hairs. I paid noticed to an eyelid that has recently lost some elasticity. I checked for suppleness of my hips and breast. I talked to 4 close friends about it. And then, on the day of my birthday.....I’ve never been so happy to Start! That which I was used to - in my head, was slipping away. 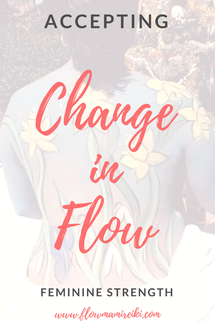 I was confronted with a possible, sudden change to ALL the ways I knew my life Flows. It was too ‘different’. Not going along with the ‘normal plan’ of how things should be. I tried to console myself with Inner Dialogue, even though I know how to track my own fertility - and self tracking was what I did for a good 10+ years. Inner Dialogue based on fear. And then I decided to accept it. I took a deep breath in, hands on my womb, my back, my hips. I gave myself a hug. And changed the Dialogue. Throughout the day I helped myself, my body, my spirit, and emotional self with ‘Energetic Movement’ - Clearing, Releasing, and Allowing. After my shower, right before bed, I rubbed one of the Essential Oil Blends (Young Living’s Sara) on my belly and heart area. The next morning, on my birthday, my Flow began. Yes, not according to plan. Yes, a few days late. Yes, I felt Fearful of a new Path that I don’t know yet how to walk. Inevitably though, it is one I plan to journey on. The Path of the Wise Wombman. Did you know that we are Meant to live Joyful and Happy Lives?